The first time I agreed to join my fiancé Brian on a joint birding/fly-fishing excursion, I wasn’t sure what to expect. While I have known how to fish since I was a little kid, I much prefer my binoculars to a fly-fishing rod, and was worried the pace of the two activities would not fit, the places I wanted to linger would not be those where he wanted to stay, or it would just be, well, not fun. Still, you never know until you try! It turns out, fishing and birding are the perfect match. Fly-fishing takes anglers to beautiful freshwater streams and rivers in pristine locations, locations that are usually filled with birds. Angling is best during the morning and evening hours, optimal times for birding as well. As an added bonus, fishermen and women must wade through the water or pick their way along the banks as they move up or down-river, a slow, rambling pace that is just perfect for birders with scopes or binoculars turned to the sky or the canopy. 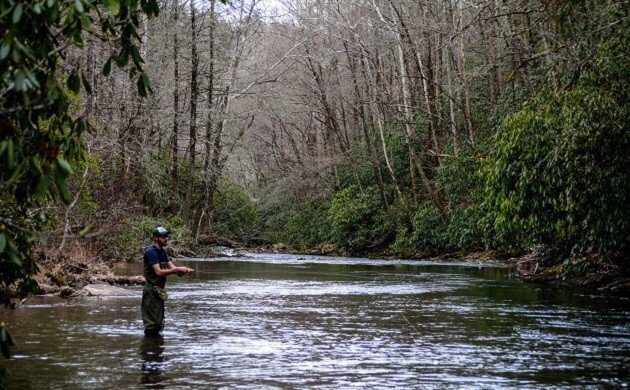 My fiancé and I now fish and bird together frequently, and over my graduate program’s spring break turned our sights to Pisgah National Forest in the mountains of western North Carolina. Pisgah National Forest stretches across 500,000 acres, and is popular with campers, bicyclists, hikers, anglers, and of course, birders. The Davidson River runs through the forest, and is so clear one can literally see the fish beneath the water’s surface. To support the river’s fishing potential, a hatchery sits near its edge, and it was there that we parked on a Sunday morning. As Brian got his fishing stuff together, I headed towards the hatchery to see what this unique feature had to offer the birds. Large black forms were soaring above the trees in slow, lazy circles, and even from a distance I knew that they were vultures. Raising my binoculars, I picked out not only Turkey Vultures, with their red heads and silver flight feathers, but also Black Vultures, with gray heads and just their wing tips sporting silver. Perhaps the vultures feasted on the fish that died at the hatchery, or perhaps the Turkey Vultures – known for their keen sense of smell – were attracted to the odor, and the Black Vultures followed them. Many of the vultures sat on the sidewalks separating the hatchery’s fish pools, where I was not allowed to enter, but others had landed on dead trees, and were unfazed as I walked directly underneath them. On one limb sat a lone Turkey Vulture, while in the very next tree perched two Black Vultures; I had never before been able to compare the two species so closely. Definitely a prime photo opportunity! While I wandered, Brian waded into the river and began fishing, but with little luck. As he made his way downstream, I noted common birds, including American Robins, Blue Jays, Carolina Chickadees, and a pair of Cedar Waxwings. As we continued however, a sound caught my attention. A light tapping came from the canopy above me, and as I craned my neck to stare upwards, I caught sight of a very, very exciting bird. Intent on exploring a tree crevice, a Red-headed Woodpecker had landed only thirty feet above me! Unlike the only other Red-headed Woodpeckers I had ever seen, this one seemed ready to stay awhile. Red-headed Woodpeckers are gorgeous birds, with bright crimson heads and bold black and white wings and bodies. Due to habitat loss, their populations have drastically declined, and they have been designated as “near-threatened” by the IUCN. I normally saw only one of these woodpeckers every year, and it was by no means a guarantee. My past observations had been fleeting, and it was a real pleasure to lean back and just watch the bird. The woodpecker finally grew tired of its tree and flew off, and I scanned the banks of the river for Brian. Though he had hooked a fish or two, they were skittish and fished over by many other anglers. To find some different waters away from the parking area, we hiked farther downstream to a fishing hole Brian had discovered on a previous trip. I sat on the bank and watched as he nimbly cast his fly into the current of a small pool. The water was cool and clear, and the trees were quiet as they stretched high above us. There were few birds now that it was midday, and even if they were present it was nearly impossible for me to hear them above the rush of the water. Still, I had had my birding success, and now it was Brian’s turn! Merely moments later a Rainbow Trout took Brian’s fly and with a great splash broke the surface as it leaped into the air. Playing it deftly, Brian soon had the fish in his net, carefully removing the barb. We stared at its beautiful colors and spots, marveling at the grace and agility possessed by so small a creature. 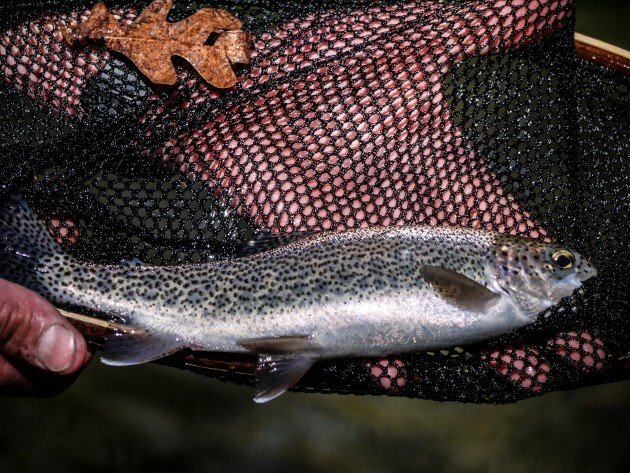 Being out in the open air is bad for the trout, and we quickly slipped the fish back into the water. We ended the day with over a dozen species for me and six or seven landed fish for Brian. Another outdoor success for the birding and fishing duo! Hi Erika and welcome to 10,000 Birds. 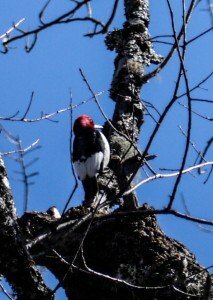 Glad to have you aboard and hoping to see a Red-headed Woodpecker myself this year! 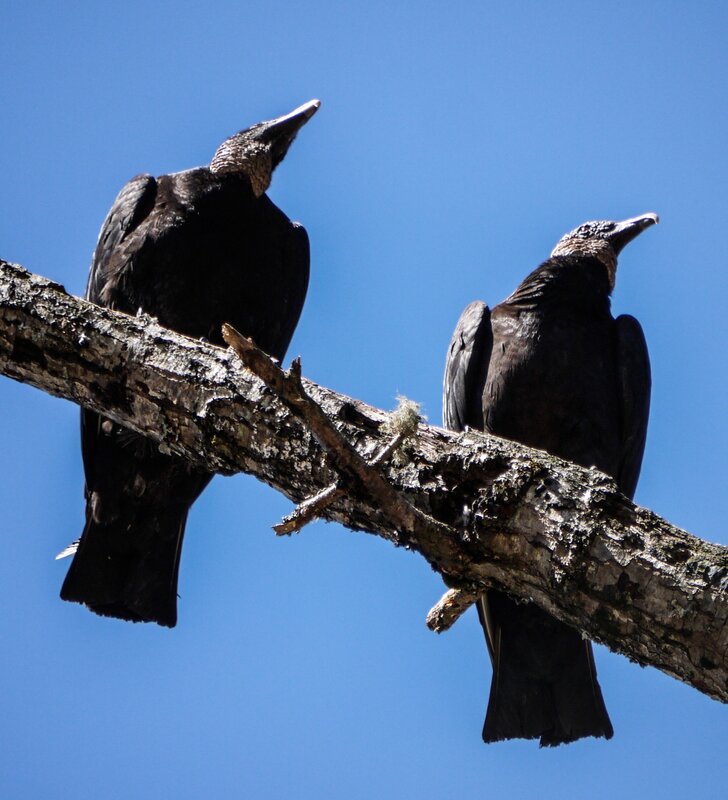 I’ve never seen Black Vultures from below – mind you, I’ve never seen Black Vultures at all… They look very ravenesque from this perspective! Great post, and welcome to the blog! Hi Erika, you did a great job of showing the complimentary nature of birding and fly fishing! Although expert at neither, i love them both. Following these activities reinforces our respect and understanding of relationships in nature. Great bird pictures, too! Amazing story! Birding and fly fishing matching with each other and giving out a successful hit, really an explanation worthwhile. Choosing your favourite gear, lures make differences. Right fishing techniques prove a comfort and fun too! Need help identifying a bird…sparrow sized, ground creeping, black with a white stripe below wings. Any ideas?